Spanish, English or Portuguese? Aera’s Sergio De Castro is fluent in all three languages, thanks to a financial career spanning more than 20 years and four continents. 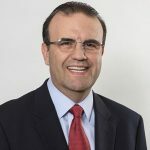 As senior vice president for strategy and chief financial officer, De Castro brings Aera a global perspective well suited to one of California’s leading oil and gas producers. A native of Bogota, Colombia, De Castro holds a bachelor’s degree in industrial engineering from Pontificia Universidad Javeriana. He also studied accounting at Universidad Externado de Colombia. De Castro later received an MBA from George Mason University in Fairfax, Virginia. Following graduation, he worked for the accounting firm Arthur Andersen and its subsidiary, Andersen Consulting. De Castro comes to Aera from its member company, ExxonMobil, which he joined in 1994. Since his first post in Bogota, De Castro has worked in ExxonMobil’s audit, controller’s and treasurer’s departments. More recently, he served as financial officer in multiple locations, including Chile, Great Britain, Angola and the U.S. His latest position with the international oil company was in Houston, Texas. De Castro was named Aera’s CFO in 2017. “In Aera, I find a unique environment with a very motivated and engaged workforce that is committed to making this business a success,” he said. De Castro is a member of the Association for Financial Professionals, which represents finance executives globally. He and his wife, Lina, have one daughter, Gabriela.